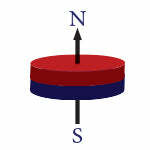 0.866" (22mm) dia x 0.118" (3mm) thick, N50 Rare Earth Neodymium Disc Magnet, Magnetized through the thickness. Nickel Plated. Will continue with future orders......great products, Thanks!